Exterior of The Star, a redevelopment of the historic Texaco building in downtown Houston. HOUSTON – (Realty News Report) – CBRE has been retained as the exclusive retail leasing agent for The Star, a residential high-rise redevelopment at 1111 Rusk in downtown. The historic 1915 Texaco Building has been redeveloped as 286 apartments and 26,170 SF of retail. CBRE’s Rachel Farris, Lacee Jacobs, and Laura Harness will lease The Star retail on behalf of the property owners, Provident Realty Advisors. The building was designed by Warren & Wetmore, the architects of Grand Central Station in Manhattan. The Star redevelopment was its recently a winner of ULI’s Development of Distinction Award, related to historic preservation and adaptive re-use. 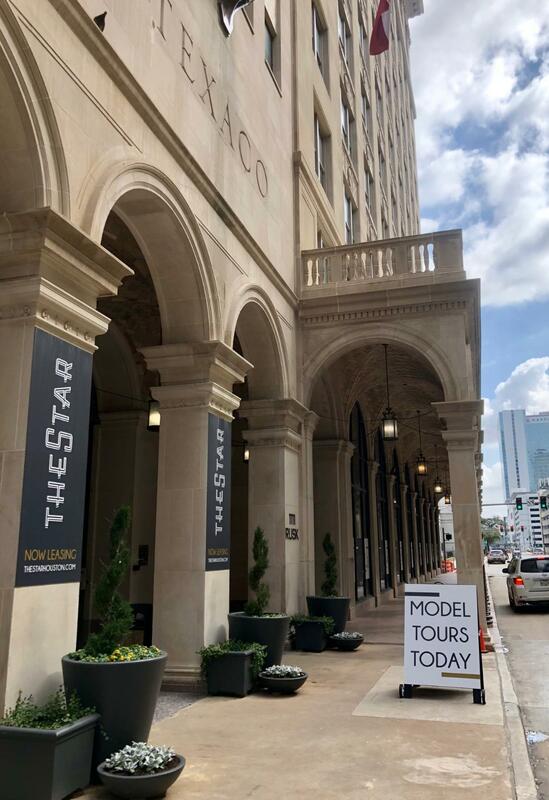 Originally designed in Renaissance Revival style with Beaux-Arts accents, the Star’s iconic spaces include grand exterior arches, 21-foot ceilings and large original historic windows.